Oh, Carol, what a mesmerizing, captivating, utterly beautiful web you weave. Director Todd Haynes has crafted an insightful, exquisite love story full of bittersweet grace, propelled by two glorious performances. Rooney Mara is Therese, a department store clerk in 1950s New York whose senses are awakened after Carol (Cate Blanchett) visits her counter at Christmastime. Though Carol is older, and married, the two fall for each other, stealing precious moments with the discretion their world demands. Haynes, adapting Patricia Highsmith’s novel The Price of Salt with screenwriter Phyllis Nagy, expands the themes he touched upon in 2002’s Far From Heaven, and infuses them with a profound and deeply felt humanity. Though the period details are meticulous, Haynes bathes his film in an almost ethereal melancholy, transporting you to a world enveloped in the ache of those pretending to be something they are not. Edward Lachman’s cinematography is an artful masterwork, and Haynes’s framing has a subtle but important impact. He often keeps Carol and Therese separated by rooms, windows, or other people, and each knowing glance carries enormous weight as two wonderful actors convey the costs of love in a way that settles in your bones. As Therese begins to trust her feelings, Mara finds the touching nuance needed to bring authenticity to her character’s journey. She is the immaculate bookend to Blanchett, who serves up another reminder of the rarefied talent she possesses. Carol seduces us just as confidently as she does Therese, with Blanchett gradually letting us glimpse the lessons learned from a life of hiding. Carol declares, “You seek resolution because you’re young,” with the voice of jaded experience, but when her husband Harge (Kyle Chandler) delivers an unexpected blow in the fight over their daughter, we feel her devastation like a punch to the gut. Great films are able to make complex issues resonate through fully realized characters and intimate, thoughtful storytelling. 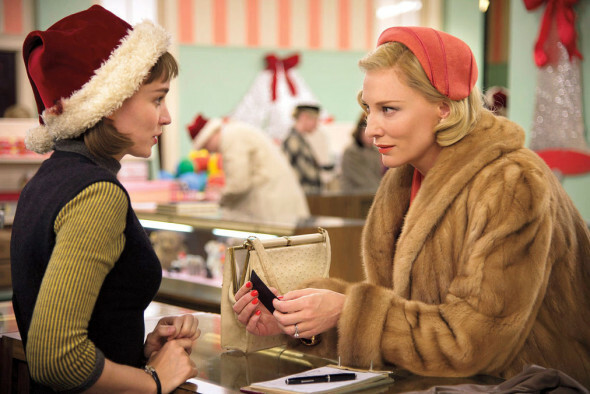 Anchored in love and restrained longing, Carol is absolutely great, as moving as any film I’ve seen this past year. ← 2015 COFCA Award Winners!